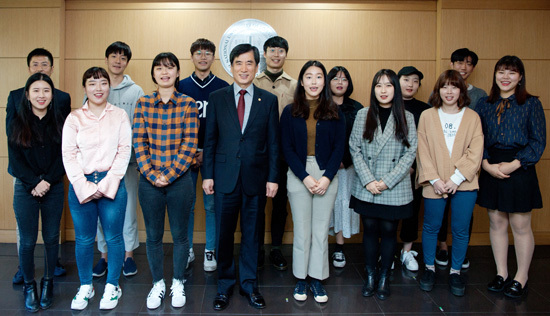 The 2018 Student UCC Competition awards ceremony was held in the conference room on the 3rd floor of the SeoulTech main building on October 18th. The best team was awarded the Grand Prize, and the next the Top Award. Five teams were awarded a participation prize, and another five were given honorable mentions. Kim recalled that the production was challenging as it required location hunting, and that it took great teamwork to complete the project. The Top Prize was awarded to the Motions team’s “Now and Here, SeoulTech.” The team made outstanding use of the skillset they had developed in the design department, and produced motion graphics and collage-style images. The Grand Prize winner was awarded two million won, the Top Prize winner one million won, and the participation award and honorable mention winners were awarded 600,000 won and 500,000 won, respectively. The director of the event, Lee Sang-jin, said, “The projects were evaluated fairly and thoroughly in three phases. Professionals from the public relations committee, department professors, and external experts participated and tried to evaluate them as objectively as possible. We appreciate the students’ efforts, and encourage their continued interest and participation in future contests."